In recent years there has been renewed interest in using preventive maintenance techniques to extend pavement life and to ensure low life cycle costs for our road infrastructure network. 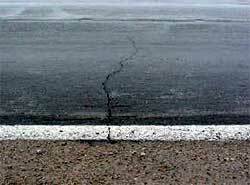 Thin maintenance surfaces can be an important part of a preventive maintenance program for asphalt cement concrete roads. The Iowa Highway Research Board have sponsored Phase Two of this research project to demonstrate the use of thin maintenance surfaces in Iowa and to develop guidelines for thin maintenance surface uses that are specific to Iowa. This report documents the results of test section construction and monitoring started in Phase One and continued in Phase Two. The report provides a recommended seal coat design process based on the McLeod method and guidance on seal coat aggregates and binders. An update on the use of local aggregates for micro-surfacing in Iowa is included. Winter maintenance guidelines for thin maintenance surfaces are reported herein. Finally, Phase One?s interim, qualitative thin maintenance surface guidelines are supplemented with Phase Two?s revised, quantitative guidelines. When thin maintenance surfaces are properly selected and applied, they can improve the pavement surface condition index and the skid resistance of pavements. For success to occur, several requirements must be met, including proper material selection, design, application rate, workmanship, and material compatibility, as well as favorable weather during application and curing. Specific guidance and recommendations for many types of thin maintenance surfaces and conditions are included in the report.